October . ., 18 . . I am not dead; just sleeping here. Shall flourish, while they sleep in dust. Other names on the gravestones are those of John Hen, 1811; William Myers, 1858; Egbert Post, 1825; Henry Post 1823; John H. Post, 1811. 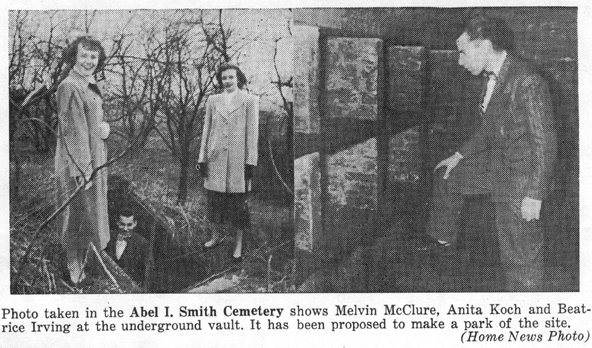 In 1948 Mrs. Marion Dudley, librarian, suggested to the town officials that the Abel I. Smith graveyard be set as a memorial park because of its age and its position, overlooking the town of Secaucus. The cemetery was never set aside as a memorial park. It is believed that the UPS company warehouse is built atop this cemetery. There was never a mention of any of the bodies being removed. If you believe you have ancestors that were buried at this cemetery, further research should be done about its fate. John Constantine, a native of Derbyshire in England, died Sept. 25, 1799, aged 40 years. John Hen died Oct. 28, 1811, aged 73 years. Jane, daughter of John and Eliza Burnett, died Apl. 7, 1804, in the 7th year of her age. Ann, wife of Peter Voorhis, Died Feb. 7, 1806, aged 36 years, 9 mos. and 7 days. Jacob Keyser died Sept. 1, 1814, aged 71 years, 1 mo. and 4 days. Daniel R. Earle died Aug. 17, 1812, aged 46 years, 8 mos. and 21 days. Charlotte Earle died Nov. 24, 1833, aged 52 years, 3 mos. and 1 day. James Van Valen born Aug. 20, 1832; died Sept. 18, 1841. William Myers died Sept. 22, 1838, in the 67th year of his age. Mary, daughter of Jonathan Stout, born the 8th and died the 16th of April 1803, aged 8days. John Smith died May 7, 1801, aged 51 years, 7 mos. and 9 days. Daniel Smith of Weehawk. died at 1 o'clock in the morning Oct. 28, 1801, in the 50th year of his age. Adrian Post died Mch. 18, 1839, aged 72 years, 11 mos. and 18 days. Rachel, wife of Adrian Post, died Apl. 30, 1839, aged 68 years, 6 months. Egbert A. Post died Mch. 3, 1823, aged 35 years, 3 mos. and 17 days. Jane Post, wife of John Compton, died Oct. 1, 1828, aged 29 years, 2mos. and 15 days. Henry Post died June 15, 1845, aged 54 years, 1 mos. and 13 days. Leah, wife of Henry Post, died Aug. 7, 1849, aged 53 years, 5 mos. and 29 days. Henry Post died Aug. 9, 1849, aged 26 years, 6 mos. and 18 days. Cornelius, son of Henry and Leah Post, died Apl. 9, 1828, aged 1 year, 5 months. Leah Ann, daughter of Adrian and Mary Ann Post, died Aug. 17, 1849, aged 8 years, 4 mos. and 11 days. Mary Leah, daughter of John and Ella Post, died Jan. 6, 1847 aged 1 year, 2 mos. and 23 days. Also about 30 old gray and brown stones without marks. Lawrence H. Smith born June 17, 1875, died in 1875, son of Able I. and Laura Smith. John Otis Smith died July 31, 1855, aged 5 months. Jane Smith died Apl. 16, 1870, aged 76 years. Prudence C. Smith born Apl. 8, 1812; died in 1850.